Below is an alphabetical listing of the composers featured on Into the Light. If a website for the composer is available, the composer's name is linked to it. 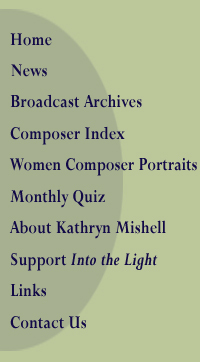 Each program number is linked to the relevant listing in our broadcast archives, so that you can see the listing (and listen to the audio, where available) for the complete program featuring the composer.